Dansk Folkeparti’s Pia Kjærsgaard, a photo by Radikale Venstre on Flickr. It’s clear that UKIP did extremely well in yesterday’s local elections in England. Some people like to compare UKIP to the BNP or to proper fascist parties, but I actually think the closest parallel is to Denmark’s Dansk Folkeparti (“Danish People’s Party”). 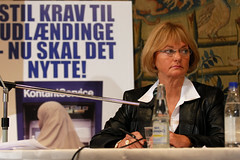 Dansk Folkeparti was founded in 1995 by former members of Fremskridtspartiet (the “Progress Party”), which had been troubled by large numbers of loonies and a prison sentence for its founder and chairman. Because of this, they have always been quick to chuck out all extremists and weirdos so that they can’t be easily dismissed as a loony party. Dansk Folkeparti has never been a great success in electoral terms, typically gaining between 10% and 15% of the votes in national elections (which is approximately the level UKIP is polling at currently). However, ever since its foundation it has had a tremendous effect on the policies of the other Danish political parties. The typical pattern has been like this: Dansk Folkeparti make a suggestion (e.g., to limit the number of immigrants, or to put some restrictions on Denmark’s EU membership); the other parties at first dismiss it, but the media give it plenty of coverage (because it’s always a good story from a journalistic point of view), and some dissenters within the other parties are quickly found that agree with it, and eventually the other parties implement at least 50% of the original proposal. As soon as this has happened, Dansk Folkeparti start demanding even more, and the whole process starts again, with the result that after 10-20 years, the mainstream parties have adopted policies that are more extreme than those originally advocated by Dansk Folkeparti. The reason the other parties adopt Dansk Folkeparti’s policies is because they fear the voters will otherwise start voting for them. In other words, it’s not because Dansk Folkeparti has actually won any elections, but because the opinion polls make the mainstream parties worried they’ll lose lots of seats in the next election if they don’t do something. We can see this in England at the moment, where many Tory MPs (and some Labour ones, too) fear they’ll lose their seat at the next general election if they don’t win back the voters who appear to be shifting to UKIP. I left Denmark in 2002, and looking at Denmark from the outside it became abundantly clear to me that the whole society was shifting to the right every single year. The effect is that while I used to define myself politically as slightly right of centre, the only party that appeals to me now in Denmark is Enhedslisten (the “Unity List”), which is the left-most party (I used to compare it to the Scottish Socialist Party). We’re already seeing how the English parties are starting to adopt UKIP’s policies. I don’t believe the Tories would have promised an in/out referendum on EU membership if he hadn’t felt threatened by UKIP’s rise in the opinion polls, and I also think Ed Miliband’s hardening stance on immigration is largely caused by UKIP. Unless they suddenly self-destruct, I’m therefore extremely worried that the presence of UKIP will cause a gradual adoption of their policies by Labour and the Tories in England. The way to defeat them is relatively simple — their policies need to be opposed rather than appeased. However, I don’t see any signs of that happening. There’s not much Scotland can do if England decides to make UKIP its lodestar. UKIP isn’t even on the political horizon in Scotland, so we will probably see the political divide between England and Scotland widening drastically over the next ten or twenty years. Independence doesn’t prevent this political change in England, but at least it means we won’t be ruled by a government that has stolen UKIP’s clothes. I’m extremely worried that England will pull us out of the EU and start making life intolerable for all immigrants. Scotland has to get off this train before it’s too late! I’m interested in international comparisons for UKIP. Here’s a Danish one: via @arcofprosperity: http://t.co/MkWn9IcTFb Any others? Poujade? @Leasky @arcofprosperity the National Front party in France. Have you moved to the left since moving to Scotland? Scotland seems to have that effect on people! You can have right wing economic views but not be anti immigration. I don’t agree with Ukip’s immigration stance but it does seem to be a major concern for a lot of people in England. Those people see it as a ‘problem’ created because of a perceived dominance of EU rules over against their elected sovereign parliament. Isn’t that not dissimilar to what pro-independence Scots feel? The political details are different but the sense of real power being somewhere other than one’s own country is the same, right? Spot on analysis. The SNP/Yes need to get this message across to Scots. One Nation my arse! I don’t do left-right politics anymore: we’re after the End of History as defined by Marx. UKIP seem to me more like anarchists (against everything, in favour of GOK), and in that sense are more like Beppe Grillo’s anti-everything party. But in Scotland we’ve got them already: it’s the SNP, with no defined position on conventional Left-Right spectrum (tho the SNP in Government has to adopt positions ad-hoc) – but an anti-Union policy into which all protests can be channeled, and a very plausible solution, which again doesn’t specify where in Left-Right politics a future Scottish Govt. might lie.